Skeeter's, Emma Stone, curly hair. Photo courtesy of DreamWorks. All French clichés aside, Emma Stone is a fresh take on old Hollywood, and I willingly give up my Saturday nights to watch movies she’s in. 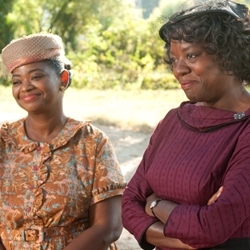 So, it should come as no surprise that when I first saw the trailer for “The Help” starring Ms. Stone, I was stoked. Better yet, her straight strands turned curly for the role. As history has it, women with curly hair are to Hollywood as Yankees are to the Deep South: outsiders. Hair has been straightened to show refinement, or curled to show rebellion. Rarely is a curly haired heroine present, and if she is, she is portrayed as strong-willed but messy and unruly. Knowing that history is the best teacher, I contained my excitement until I could figure out just who Stone’s leading character, Eugenia ‘Skeeter’ Phelan, is. Who is Eugenia 'Skeeter' Phelan? The woman on the right's hair is the curliest it gets, besides Emma Stone's. Photo courtesy of DreamWorks. As I expected, Skeeter is an outsider, but in a day and age where the 1960’s are no longer idealized — and a source of cultural embarrassment concerning how others were treated — she is a good outsider. Her curly hair set her apart from her less educated, extremely domesticated white female friends. Skeeter is the only one with a college degree, and the only one without a husband. Her struggles to land a position doing what she loves, writing, has her back in her hometown of Jackson, Mississippi, in which she is ridiculed for her education, for her bare ring finger and for her curly hair. However, Skeeter does find herself a position, as a domestic duties columnist, in which she discovers and embraces the opportunity to call out her white friends’ mistreatment of the black “help” they so insanely rely upon. In doing so, she calls attention to a problem that many wanted uncovered, and that others would fight to keep hidden. However, for curlies like me, this movie is about more than a heroines adventure; it is about changing the status quo, whether you're black, white, curly or straight haired. Did you just gasp? Me too. And, we aren’t the only ones. Obviously, Hollywood’s subliminal attempt at convincing the world that curls should be straightened to fit into cultural norms lured Fox News in. Thankfully, their readers weren’t as persuaded – and neither are we! Finally, a curly female character who isn’t only an outsider, but ahead of her time, which makes her outsider position all the better. Skeeter may be one of the only non-animated curly heroines who isn't considered unruly or improper, but animation was "Brave" enough to attempt it as well! Check it out! One qualm I do have with the film: why aren’t any of the black women curly? Unless all of those women let their natural hair loose at the end of the film, I’m confused about why the producer didn’t continue the curly-themed differentiation, and power, throughout. So, has anyone seen it? Do they let their hair down in the end? Let me know.